Here is a new idea for you, and fun for the kids! We love Kool-Aid in our family. As a teen, it was a fun summer experience to dye hair with Kool-Aid, I sported purple (grape), blue (berry blue) and even a burgundy (cherry perhaps) colors in the summer. It washed out relatively quickly. My father learned that my cousins found his willingness to be a guinea pig awesome. My father also learned that lime green mustache and beard will leak when you work in an aluminum plant that had very high heat. High heat=hot body=sweat=lime lips. My dad never tried that again! 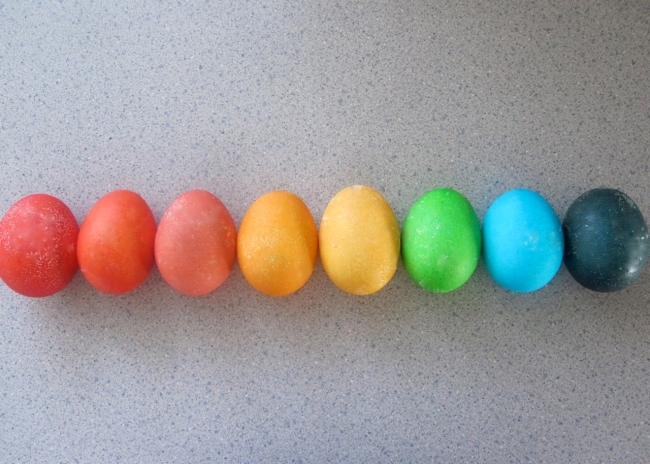 So when I saw an idea for Kool-Aid dyed eggs, I knew I had to try it, since I might be a little too old for blue hair now (secretly I still wish for some rad colors though). The end result of the Kool-Aid egg dye method is not perfect. I got splotches and I couldn't get the boldness of traditional egg dye. It was a new experience however and it was fun to try. If you have the materials on hand, even better. The eggs I used were not store-purchased and perhaps this makes a difference. Store-bought eggs seem more smooth at times than my backyard birdy's eggs (though hers do taste better and are likely more healthy). If you have a cracked egg it is possible that you may get to experience my father's feelings on Kool-Aid leak. None of my eggs broke, so I didn't have any problem with the Kool-Aid dye getting under the shell and none of the eggs taste like Kool-Aid. My favorite color was from blue Kool-Aid mixed with a little lemon lime. It turned this awesome light turquoise that reminded me of a robin's egg. Here is a color guide to help you out! If you want to get crafty and pick some other flavors to try I have a cheat for you! Look at the Kool-Aid package, the color in the glass that the Kool-Aid man is holding is the color the dye will turn out to be! This doesn't hold true for off brands of powdered drink mix, but most often you can guess what the color will be. Off brand mixes should work just the same as the regular stuff. I did not try any crystal light type of beverage, so I don't know how that would work out. Finally here are the directions. Simply mix one package of Kool-Aid with one cup of very warm water, I also added a splash of white distilled vinegar, to help set the color. I am not sure that the vinegar was needed but that is what I did. Mix well and then lower the egg into the mixture. 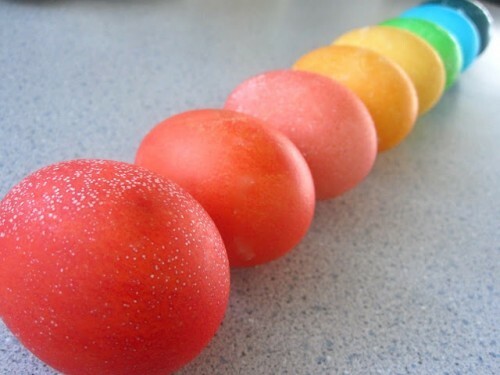 The longer you leave the egg the more bold the color. After awhile however the eggs seemed to speckle, which just made them more interesting! Let the eggs dry well, I suggest a baking rack with paper toweling under so your counter top doesn't get dyed as well. Once dried, I didn't have color leakage, but it is possible, so watch your little's in their adorable Easter attire with these, especially if a bunny leaves them in the grass overnight and the dew makes things wet.